Be the sunshine of anyone’s eyes dressed in such a wonderful black pure georgette anarkali salwar suit. The enticing embroidered and resham work a vital characteristic of this attire. Comes with matching bottom and dupatta. 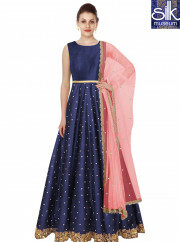 Note - Maximum possible Ready size: 42 inches (Bust Size). Slight variation in color, fabric & work is possible. Model images are only representative.